500 Startups announced its investment in Canada with this image. 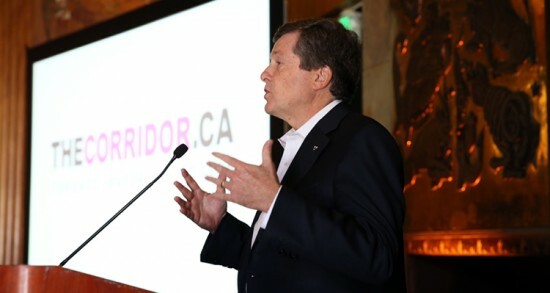 At the CityAge conference in San Francisco, Toronto Mayor John Tory stood next to a large, simplified map comparing the distance between Toronto and Waterloo, Ont. to that of San Francisco and San Jose, Calif. – about the same, the map showed. The message epitomized the message that Tory and the rest of the region’s trade mission delegation brought to Silicon Valley – take another look at what’s happening here, we’re not so different. Tory, alongside the mayors of Kitchener, Waterloo, and Cambridge Ont. were promoting the idea of The Corridor as a homogenous region bursting with promise for innovative startups. Tory himself described the trip as “promotional” and its the latest of a series of collaborative efforts between the cities to draw interest from the entrepreneurial community, as well as support from other levels of governments for better transit options. Among the stated goals of the San Francisco trade mission was piquing interest of venture capitalists, and appealing to Canadian ex-pats to come back home and put their talent to work in their native region. Yet not everyone in the crowd at the CityAge conference was buying it. Guy Gal is an entrepreneur in residence at San Francisco-based Matrix Partners and a former Toronto startup founder. He says he found Tory’s speech to be “tone deaf.” Depicting Toronto-Waterloo to be just a good for entrepreneurs as Silicon Valley isn’t realistic in his view. The Corridor initiative seems to be more about building a light rail line to connect the region than it does addressing the needs of startups, Gal adds. To build up the level of risk capital in the region is a project that will take decades, not be achieved overnight. Another Mississauga-based entrepreneur also sees the recent trade mission’s goals as unrealistic. While Carl Rodrigues, CEO of enterprise mobility management software firm SOTI Inc., says the mayors were trying to do the right thing with their trip, it’s an uphill battle to woo talent back home. “The regular guy is a programmer working for Google and any Canadian company would love to have him… but there’s no financial incentive for him to do so,” Rodrigues says. With Canadian income taxes being higher than those in the U.S. and the Canadian dollar weaker, companies just can’t offer technical talent what they could earn in the U.S. Nor can most Canadian companies match the brand power of Silicon Valley giants, Rodrigues says. Drawing U.S. investment in Canada also has its downsides, such as the ownership of intellectual property being siphoned south of the border. “It’s important to realize that part of the benefit remains in Canada, but not 100 per cent of the investment,” he says. In some ways, the trade mission’s goals of seeing VC and talent flow from Silicon Valley to Toronto-Waterloo is already happening. On March 31, just a couple days before the trade mission started, accelerator program 500 Startups announced it plans to invest $30 million into Ontario-based startups over the next several years. In a blog post describing Canada as a hot market with good government support, 500 Startups promised 150 investments will be made in Ontario. It plans to bring best practices from Silicon Valley to the region and help funded companies reach an international market more quickly. Factors such as a lower Canadian dollar and recognition of tax advantages and grant programs for businesses were cited as reasons for the investment by Sanjay Singhal, a Canadian venture partner at 500 Startups in an interview broadcast on Bloomberg TV Canada. Thre’s also examples of entrepreneurs starting a business at home after working with a big company in the Valley. Daniel Debow is a Toronto-area entrepreneur that Tory mentioned in his speech at the CityAge summit. After his startup Rypple was acquired by Salesforce.com Inc., Debow spent a few years working with the cloud software firm as an executive. Now he’s in the early stages of starting a new company in Toronto – though he’s quick to point out he never really left. “My residence there was a hotel,” he says of San Francisco. Toronto offers a great place to start a technology company, Debow says, stocked full of talent and offering a good quality of life to employees. Plus, it’s a quick flight to several major U.S. population centres. The mayors’ trade mission is helpful, he says, because it helps add some “sizzle” to the substance offered by Canadian startups. But it’s not the only aspect that matters and government could do more to help startups here at home. Rather than offer more hand-outs or accelerator programs, local governments could hire startup firms and become customers, providing them with what they really need – revenue. While choosing to build a business in The Corridor or Silicon Valley is often posed as a debate in the entrepreneurial community, many chart a path that includes both regions in their startup journey. The most successful founders often look to take advantage of what both urban centres have to offer. 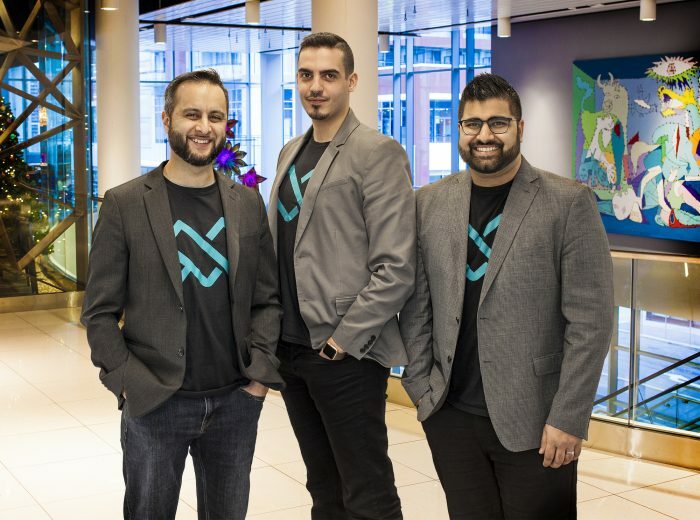 For instance, Gal, who also advises Kitchener, Ont.-based startup Vidyard, says he wouldn’t advocate for them to uproot and move to the Valley. Debow also says it all comes down to the quality of the startup team and what it has to offer that will determine its success, not where it’s based. “If you have the willingness to hustle you can raise money,” he says.